William Walker and his wife, Mi Chong, wanted to join what's seen as a solar revolution in Hawaii. Shortly after buying their Oahu home earlier this year, they plunked down $35,000 for a rooftop photovoltaic system. The couple looked forward to joining neighbors who had added panels, to cutting their $250 monthly power bills and to knowing they were helping the environment. Their plans shifted the day after the PV panels went up in early October. The Walkers learned from a neighbor about a major change in the local utility's solar policy. It led to those 18 panels sitting dormant nearly three months later. Hawaiian Electric Co., or HECO, in September told solar contractors on Oahu that the island's solar boom is creating problems. On many circuits, the utility said, there's so much solar energy that it poses a threat to the system and a safety issue. Studies are needed on whether grid upgrades are necessary. If they are, residents adding solar must foot the bill. And starting immediately, contractors and residents would need permission to connect most small rooftop systems to the grid. A series on the plight of the world's islands and island nations. They contributed very little to the changing climate from man-made greenhouse gas emissions, but some may pay with their lives. The new HECO policy was included deep in the text of emails the Walkers' solar contractor had sent, but it escaped their notice before installation. They're now paying $300 per month on a loan for the panels, plus the $250 electric bill. "It goes from frustration to outrage," William Walker, 33, said of his reaction. "We hear the excuses that HECO provides, that they put out there at least as far as the justification. There's really not a lot of substantiation. My belief is it's purely profit-motivated, to keep people away from PV and keep them on the grid." HECO officials called it a needed precaution. "We can't allow circuits to become dangerous," said Peter Rosegg, a utility spokesman. "We can't allow circuits to become unreliable because there's too much PV on those circuits." The policy change halted what has been a solar surge in Hawaii. Installations there jumped 169 percent last year from 2011. More than 4 percent of households have photovoltaics. Hawaii last year led the nation in the portion of its electricity that comes from solar, with 2.6 percent. The Aloha State burns oil to make electricity, and prices for the fuel have jumped in recent years, igniting demand for alternatives. The state's tax credit for solar energy made it additionally appealing (ClimateWire, May 6). The new struggle on Hawaii foreshadows what the rest of the country could face as solar moves closer to the mainstream, several involved in the debate said. "Hawaii is a crystal ball into what every other state is going to have to look at as they start reaching higher and higher levels of solar activity," said Robert Harris, executive director of Sierra Club Hawaii. "There is a national debate about what is the future model of the utility. That is happening in real time in Hawaii." The Hawaii development comes amid battles in California, Arizona and Colorado over the future of net energy metering (NEM). That policy -- which exists in some form in 43 states and the District of Columbia -- lets households with renewable energy earn bill credits for surplus power delivered to the grid. Utilities in states with growing levels of solar have argued that fixed fees and other changes are needed because customers with net metering bill credits don't pay their fair share of transmission and distribution charges. The Golden State's Legislature has ordered the California Public Utilities Commission to retool NEM by 2015. The new program will need to be "based on electrical system costs and benefits to nonparticipating ratepayers." Arizona's utility regulator last month approved a hike in the surcharge that solar customers with net metering pay the state's largest utility. The Arizona Corporation Commission ordered workshops to study the value and costs associated with NEM. Conversations about net metering are beginning in Louisiana, parts of Texas, Illinois, New York and Massachusetts (ClimateWire, Dec. 11). 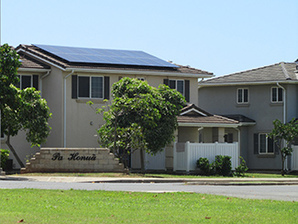 Rooftop solar has expanded rapidly in Hawaii. Photo by Anne C. Mulkern. Charles Wang, with the Hawaii ECO Project, at a solar conference in San Diego earlier this month warned people from other states that Hawaii is a "cautionary tale" and "something that you will face down the road in your marketplaces." "I am from the future," Wang told a room of industry and environmental representatives. "The utility is that 800-pound gorilla. If you push it to the corner of the room, it's going to fight back. That's what's happening right now." The HECO policy is only for Oahu, but a similar rule already is in effect on Maui and the Big Island. It's more controversial on Oahu, however, because it's home to about 80 percent of the state's population. About 900,000 people live on Oahu. On Oahu, 10 percent of utility customers will have rooftop solar by year-end, Rosegg said. That compares with California, where it is 2 to 3 percent, he said. And demand for new connections for PV has been heavy. "These applications were rolling in at such an aggressive rate. ... We simply had to get advance notice that these were coming in," Rosegg said. The utility's grid wasn't designed for power to go two directions, Rosegg said. The ability for PV to make more power than would be used in a neighborhood creates a situation where there is "overvoltage." The energy can flow back to the substation, he said, which can lead to reliability problems and possibly surges. And if crews are working in the area, there's a potential danger. Others say the utility fears more solar expansion and hasn't developed a plan to adjust. "It's no doubt a threat, and down the road utilities have to seriously look at their business model," said Leslie Cole-Brooks, Hawaii Solar Energy Association executive director. "It's a whole new era because these technologies are available." The HECO change has triggered a push for help from the state's Legislature when it reconvenes Jan. 15. Sierra Club Hawaii and others are working on potential bills to ease the burden on homeowners. Measures could include helping the utility make grid improvements, said Harris with Sierra Club Hawaii. The goal is to make sure more renewable energy can come online, he said, and to develop a way to pay for it that is "fair and equitable" for all customers. The new edict for Oahu mostly focuses on grid circuits where power available from rooftop solar reaches or exceeds 100 percent of the minimum daytime load, the low point of the total power that customers on a circuit are using. Areas at that level will require interconnection requirements studies. Circuits at 75 percent could also need the studies. Residents who want to add solar in other parts of Oahu must apply with HECO and wait for approval. About one-fourth of circuits on Oahu are at 100 percent, Rosegg said. At the current rate of adoption, Harris said, all electrical circuits controlled by the utility could be closed to small-scale solar within six months. HECO, meanwhile, is planning interconnection studies on what it calls "representative" circuits "already heavily loaded with PV." It will use the results to evaluate other circuits and tell customers who want to add solar what they'd need to pay to upgrade the grid. Changes could include adding grounding transformers or increasing the capacity of a substation, Rosegg said. The utility's analysis won't be finished until early next year. Hawaii's solar market slowed dramatically after HECO's letter. Permits for photovoltaic projects issued on Oahu fell to 1,246 in October, down 49 percent from a high of 2,433 a year earlier. Last month they were at 1,040, a 48 percent drop from 1,996 in November 2012. Marco Mangelsdorf, president of ProVision Solar on the Big Island, pulled the data from the Honolulu County and city planning website. Before the HECO policy change, Walter's Electric -- based on the Big Island -- was setting company records for solar installations. The last three months of the year look especially promising, said company President Kaimi Walter Chung. "It looked like we were going to have our best quarter," Chung said. "We were ramping up to do a lot of jobs." Now Walter's Electric has 70 customers on Oahu and 50 on other islands waiting for installation approval. Chung has had to focus more on the electrical services his company provides. Other solar companies have developed new sales strategies to attract business, including selling the idea of independence. Island Pacific Energy ran a full-page advertisement in the local paper promoting the idea of buying batteries for solar storage and sidestepping HECO's rule. "Get solar now," the ad said. "No waiting for utility approval. No added grid upgrade costs." Poncho's Solar ran an ad telling people they can opt for batteries and "avoid those extra costs." Systems would have to be independent of the grid to sidestep the safety review and potential grid upgrade costs, Rosegg said. Disconnecting from the grid is not realistic for most people, Chung said. The current state of battery technology means they have to be replaced after a few years, he said. And putting a system with batteries on a typical house would cost $40,000 versus $25,000 for one without the storage component, he said. Moreover, the battery portion isn't eligible for the tax credits. "Eventually, I guess that's how people are going to have to go, but I don't think it's feasible" right now, Chung said. Some customers are going forward with solar despite HECO's new policy. Ron Hayashi, 61, this week had solar panels installed on his Oahu home, despite not having HECO approval to connect to the grid. The neighborhood where he lives already has solar capacity at 100 percent of the minimum daily load. Hayashi withdrew money from his 401(k) in order to buy a $14,800 solar system for his house. He wanted to get it connected by year's end to take advantage of state and federal tax credits. After factoring those in, the electric bill savings from the panels will mean the investment is paid back in just under two years, he said. Hayashi bought a system with batteries called an "energy shifter" and believes -- based on what his solar contractor told him -- that HECO cannot refuse to connect the home once the utility's safety study is complete. He needs to be connected for the system to work. "If I use the energy shifter, they cannot refuse you," Hayashi said. Cole-Brooks with the Hawaii Solar Energy Association said she and other advocates are talking to HECO about making accommodations for households that have batteries but want to be connected to the grid. There's not a safety issue posed by those systems, she said, because extra power is going into the batteries and not the grid. But Rosegg with HECO said that right now there is no special treatment for systems that have batteries. Because there's confusion about the rules, he said, the utility plans to run an advertisement in the local paper in a few days cautioning people that even if they are buying systems with batteries, they need to first contact HECO. "Nobody has a special dispensation to connect to the grid," Rosegg said. "Everybody has to go through the process. If an inspection is needed, we'll do that. If upgrades are needed, we'll do that. Everybody is treated the same."